Pope Saint Stephen I served as bishop of Rome from May 12, 254 to August 2, 257. Of Roman birth but of Greek ancestry, he was promoted to the papacy after serving as the archdeacon of Pope Lucius I, who appointed Stephen his successor. The Christian church of Stephen's time was torn by a major schism over the question of the treatment of the lapsi, former Christians who had denied the faith and committed idolatry during the Decian persecution of 250-251. The Catholic position was to grant communion to returning lapsi after due penance, while the Novatianists allowed the laspi fellowship, but not communion. Stephen became involved in a major controversy with Saint Cyprian of Carthage over the question of validity of baptisms administered by Novatianist clergy. Cyprian and other bishops of the Roman provinces of Africa and Asia Minor held that such sacraments were not valid, while Stephen insisted that, as long as the baptismal formula was technically correct, the Church must recognize the baptisms as valid. The controversy threatened another schism immediately on the heals of the split with the Novatianists, but Stephen's view ultimately prevailed and became the standard of the Catholic Church to this day. Stephen also disagreed with Cyprian and other bishops who insisted that certain of their colleagues be excommunicated or deposed. Although some sources call Stephen a martyr, others say he died of natural causes. Saint Stephen I's feast day in the Roman Catholic Church is celebrated on August 2. According to the most ancient lists, Stephen I was a Roman by birth, and the son of a man named Jovius. Little is known regarding his background. However, the Liber Pontificalis indicates that he served as archdeacon to Pope Lucius I, who appointed Stephen as his successor in 254, just before his own martyrdom. Most of what we know regarding Pope Stephen is connected directly or indirectly with the Novatianist controversy which by this time raged in the Christian churches throughout the Roman Empire. Novatian had been consecrated as a rival pope to Pope Cornelius a few years earlier in the wake of early Decian persecutions. The issue of Novatian's opposition centered on the question of the treatment of the lapsi, those Christians who had committed the sins of apostasy and idolatry by publicly sacrificing to the Roman gods in order to save their lives. Cornelius supported readmitting such persons to full communion after penance and absolution. Novatian insisted that the church did not have the authority to forgive mortal sins such as these. He favored receiving repentant apostates into fellowship, but withholding the Eucharist from them, since their sin could be forgiven only by God. Saint Cyprian of Carthage was an ally of Stephen I in the Novationist controversy, but opposed him on the issue of the validity of heretical baptism. Stephen's most important action was his defense of the validity of baptism performed by Novatianist priests. Several letters of Saint Cyprian of Carthage deal with Stephen's policy on the matter, with which Cyprian, although an important ally on other aspects of the Novatianist controversy, expresses strong disagreement. Cyprian and other bishops of Africa and Asia held that Novatianist baptisms were "heretical," and thus invalid, and that re-baptism was required for those who had received the sacraments from Novatianist ministers. Stephen insisted that, while absolution was required for Novatianists who wished to be admitted to communion, re-baptism was both unwise and unnecessary. The controversy threatened to create a new schism within the church, but during the time of his successor, Sixtus II, Stephen's view ultimately prevailed. However, the issue of the validity of heretical sacraments would plague the church in a major way during the later Donatist controversy. Stephen seems to have been "soft" on Novatianism in other ways besides the question of the validity of their baptisms. In the early part of his pontificate, Stephen was urged on several occasions by Bishop Faustinus of Lyons to take action against the allegedly Novatianist Bishop Marcian (or Marcion) of Arles. Marcian was accused of adhering to the Novatianist policy of denying communion to the penitent lapsi. Stephen, however, did not move against Marcian. The bishops of Gaul then turned to Cyprian and moved him to write to Stephen, which he accordingly did (Ep. 66). Cyprian urged Stephen to instruct the bishops of Gaul to condemn Marcian, and to elect another bishop in his stead: "Let letters be directed by you into the province and to the people abiding at Arles, by which, Marcian being excommunicated, another may be substituted in his place, and Christ's flock, which even to this day is contemned as scattered and wounded by him, may be gathered together." Since much of Cyprian's correspondence survives and no more is said by him about the matter, it is supposed by some that the pope acted in accordance with his wishes, and that Marcian was deposed. However, inasmuch as Cyprian's failed to convince Stephen on the issue of the validity of heretical baptism, this supposition may be overreaching. The case of the Spanish bishops Martial and Basilides also brought Cyprian into correspondence with Stephen. As libellatici—holders of certificates attesting that they had conformed to the religious tests required by Emperor Decius—they had been condemned by the bishops of their province for apostasy. At first they acknowledged their guilt, but later appealed to Rome, and Stephen supported their restoration. Accordingly, some of their fellow bishops accepted them, but the others complained of the case to Cyprian. As bishop of Carthage, Cyprian assembled a synod of African bishops, which renewed the condemnation of Basilides and Martial and exhorted Christians to enter into communion with other new bishops. The council claimed that Stephen, being "situated at a distance and ignorant of the true facts of the case," had been deceived on the matter. Stephen, like his predecessors, used the wealth of the Roman church to relieve the suffering of churches elsewhere in the empire. Thus, we are told, he helped "all the provinces of Syria and Arabia." The Liber Pontificalis says that he ordained that the vestments which had been used for ecclesiastical purposes—namely the Mass—were not to be employed for daily wear. This source, however, routinely ascribes similar edicts to popes anachronistically, and this report must thus be treated with some skepticism. The same may be said with the Liber's claim that he ended his pontificate by martyrdom, since it claims this for virtually all the early popes, even when their papacy took place in times of peace. Stephen I was buried in the catacombs of Saint Callixtus, and his body was later transferred by Pope Paul I to a monastery founded in Stephen's honor. 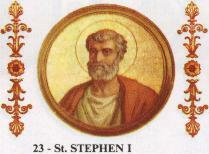 Although his martyrdom is no longer considered to be historically attested, Stephen I was long venerated as such. Archbishop Emmanuel Milingo, who has consecrated several married priests as bishops, is one beneficiary of the policy of Stephen I, who decided that sacraments performed by excommunicated bishops, must be considered valid. It was said that, as he was sitting on his pontifical throne in the catacombs celebrating Mass for his congregation the emperor's men came and beheaded Stephen on August 2, 257. As late as the eighteenth century, the supposed chair on which he sat was preserved, still stained with blood. However, Valerian's initial persecution of Christians in 257 did not order summary execution of bishops. The story is so nearly identical with that of Stephen's successor,Sixtus II, that it is now dismissed by most scholars as a conflation with the history of Pope Sixtus II, who was one of the first victims of Valerian's 258 persecution. Stephen's most important legacy was his policy regarding the validity of heretical baptism. 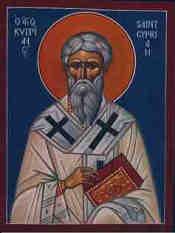 By taking this position, maintained in the face of the opposition of many African and Asian churches led by the formidable figure of Cyprian of Carthage, Stephen protected the spiritual status of Christians who sincerely believed themselves to be properly baptized and made it easier for them to rejoin the Catholic Church. He also set the precedent, which is maintained to this day, that any sacrament correctly administered by a properly ordained priest or bishop is technically valid, even if that particular minister has fallen into serious heresy and has been excommunicated. When the new feast of Saint Alphonsus Liguori was assigned to August 2 in 1839, Saint Stephen I was mentioned only as a commemoration within the Mass of Saint Alphonsus. The revision of the calendar of saints in 1969 removed the mention of Saint Stephen I from the General Roman Calendar. However, according to the General Instruction of the Roman Missal, the August 2 Mass may now be celebrated in honor of him, unless in some locality an obligatory celebration is assigned to that day. ↑ "General Instruction of the Roman Missal" 355 c. Retrieved January 11, 2009. Maxwell-Stuart, P. G. Chronicle of the Popes: The Reign-by-Reign Record of the Papacy from St. Peter to the Present. New York, N.Y.: Thames and Hudson, 1997. ISBN 0500017980. History of "Pope Stephen I"
This page was last modified on 22 May 2015, at 20:46.